(1983) "Here Comes the Rain Again"
"Here Comes the Rain Again" is a 1984 song by British duo Eurythmics. It was written by group members Annie Lennox and David A. Stewart and produced by Stewart. The song was released on 12 January 1984 as the third single in the UK from the album Touch and in the United States as the first single. It became Eurythmics' second Top 10 U.S. hit, peaking at number 4 on the Billboard Hot 100. "Here Comes the Rain Again" hit number eight in the UK Singles Chart, becoming their fifth consecutive Top 10 single in that country. Stewart explained to Songfacts that creating a melancholy mood in his songs is something at which he excels. He said: "'Here Comes the Rain Again' is kind of a perfect one where it has a mixture of things, because I'm playing a b-minor, but then I change it to put a b-natural in, and so it kind of feels like that minor is suspended, or major. So it's kind of a weird course. And of course that starts the whole song, and the whole song was about that undecided thing, like here comes depression, or here comes that downward spiral. But then it goes, 'so talk to me like lovers do.' It's the wandering in and out of melancholy, a dark beauty that sort of is like the rose that's when it's darkest unfolding and bloodred just before the garden, dies. And capturing that in kind of oblique statements and sentiments." The string arrangements by Michael Kamen were performed by members of the British Philharmonic Orchestra. However, due to the limited space in the studio, the Church, the players had to improvise by recording their parts in other parts of the studio. The song was then mixed by blending the orchestral tracks on top of the original synthesized backing track. During Eurythmics reunion "Peacetour" they performed an in-studio concert for the A&E Network in the U.S. Dave Stewart revealed that the lyrics to the song came into being after an argument between him and Lennox while they were doing some songwriting in New York City's Columbus Hotel. The basic melody had already been written and Lennox looked out the window after their fight and noticed it was starting to rain. She announced, "Here comes the rain again." The running time for "Here Comes the Rain Again" is in actuality about five minutes long and was edited on the Touch album (fading out at approximately four-and-a-half minutes). Although it was edited even further for its single and video release, many U.S. radio stations played the full-length version of it. 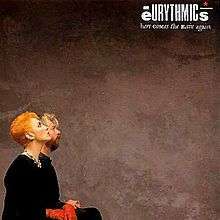 The entire five-minute version did not appear on any Eurythmics album until the U.S. edition of Greatest Hits in 1991. In the UK, the single became Eurythmics' fifth Top 10 hit, peaking at #8. It was the duo's second top ten hit in the United States, peaking at #4 in March 1984. The music video, featuring both Annie Lennox and Dave Stewart, was directed by Stewart, John Gerschfield and Jon Roseman, and released in December 1983, a month before the single came out. The video opens with a passing aerial shot of The Old Man of Hoy on the Island of Hoy in the Orkney Islands before transitioning to Lennox walking along the rocky shore and cliff top. She later explores a derelict cottage while wearing a nightgown and holding a lantern. Stewart stalks her with a video camera. In many scenes the two are filmed separately, then superimposed into the same frame. The result is that the viewer may perceive one as being a ghost in the world of the other. The song's opening was used in the Belgium Dance act Oxy's 1992 single "The Feeling." George Nozuka sings the same note when he says "Talk to me" with a slight stutter on his hit single, "Talk to Me". Another hit by Nozuka, "Last Night", features a riff that is inspired by "Sweet Dreams". The line "Talk to me" is sampled in Alice DeeJay's song "Better Off Alone". The lyrics of the chorus were sampled in the 1995 song "Tragedy" by RZA from the Wu-Tang Clan. The lyrics "Walk with me, like lovers do/Talk to me, like lovers do" were used in Platinum Weird's song "Taking Chances" which incidentally, was co-written by Stewart. "Taking Chances" was later covered by Celine Dion and released as the title track of her 2007 album. The lyrics of the chorus were sampled in Jamaican singer's Nadirah X song Here It Comes in 2010 on her debut album Ink. Madonna sampled the song on her Sticky and Sweet Tour in 2008-2009 with her own song Rain as an video interlude. Madonna layered elements of her own "Rain" with "Here Comes the Rain Again" for a video interlude in her 2008–2009 Sticky and Sweet Tour. ↑ "Record News". NME. London, England: IPC Media: 28. 7 January 1984. 1 2 "Here Comes The Rain Again". Songfacts.com. Retrieved 2009-11-28. ↑ Kent, David (1993). Australian Chart Book 1970–1992. St Ives, NSW: Australian Chart Book. p. 105. ISBN 0-646-11917-6. ↑ "Ultratop.be – Eurythmics – Here Comes the Rain Again" (in Dutch). Ultratop 50. ↑ "Results - RPM - Library and Archives Canada". Collectionscanada.gc.ca. Retrieved 2012-01-06. ↑ "RPM 50 Singles". RPM – Volume 40, No. 2. 17 March 1984. Retrieved 5 April 2016. 1 2 "InfoDisc : Tout les Titres par Artiste". Infodisc.fr. Retrieved 2012-01-06. ↑ "Musicline.de – Eurythmics Single-Chartverfolgung" (in German). Media Control Charts. PhonoNet GmbH. ↑ "The Irish Charts – Search Results – Here Comes the Rain Again". Irish Singles Chart. ↑ "Dutchcharts.nl – Eurythmics – Here Comes the Rain Again" (in Dutch). Single Top 100. ↑ "Charts.org.nz – Eurythmics – Here Comes the Rain Again". Top 40 Singles. ↑ "Norwegiancharts.com – Eurythmics – Here Comes the Rain Again". VG-lista. ↑ "Archiwum Listy Przebojów Programu Trzeciego". lp3.pl. Retrieved 2014-04-05. ↑ "Swedishcharts.com – Eurythmics – Here Comes the Rain Again". Singles Top 100. ↑ "Swisscharts.com – Eurythmics – Here Comes the Rain Again". Swiss Singles Chart. ↑ "Archive Chart: 1984-02-04" UK Singles Chart. ↑ "Eurythmics – Chart history" Billboard Hot 100 for Eurythmics. ↑ "Eurythmics – Chart history" Billboard Adult Contemporary for Eurythmics. ↑ "Touch – Awards at AllMusic". AllMusic. Retrieved 5 April 2016.